Another day in the Android tablet saga, and more and more information is leaking about various manufacturers' Android-based tablets. Reports indicate that ASUS's Eee Pad, seen running Windows at CES back in January, will instead run Android when it is launched in 2011. The device is a NVIDA Tegra2 powered tablet with a 10" screen. Little else is known other than that 3G carriers could start seeing devices in December for testing. 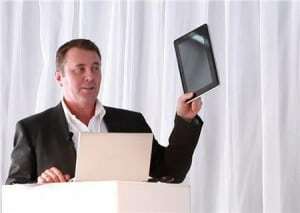 Toshiba's Mark Whittard, Australian Managing Director for the company, showed a tablet prototype and said that the device will be available before October. No hardware details were released, but the prototype on display featured HDMI output, USB connectivity, multi-touch and could run either Windows 7 and Android. Lenovo has also outed their "LePad" to complement their "LePhone" released earlier this year. The portable computer manufacturer stated that they believe Apple CEO Steve Jobs has not focused on the Chinese market. Lenovo sees tablets, associated hardware and services as becoming as much as 20% of the company's revenue over the next 5 years.